Specialising in maintenance, repairs & restoration of your properties. Troy completed his electrical apprenticeship in Perth, Western Australia, becoming a fully qualified 'A' grade Electrical Tradesperson in 2004. During his training Troy was recognised for his skills and knowledge, awarded the Apprentice of the Year 2003 (Electrical Industrial Wholesalers/NESCO Award) to add to his Best Pre-Apprentice Award received in 2002 from the West-Coast College of TAFE. 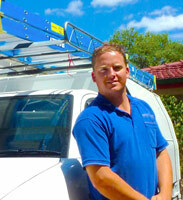 He was fortunate enough to master his trade under the eye of one of Perth's largest electrical service providers, which saw Troy facing a diverse range of training situations, helping him to fine tune his problem solving skills, quality of work and on-the-job knowledge of all electrical practices. Married with two wonderful children, Troy also actively participates in community and charitable projects including, most recently, fundraising for the 2012 Variety Club Bash for Appealathon: http://www.variety.org.au/. He prides himself on good communication skills, producing a high quality of work, keeping up-to-date with the latest industry knowledge and practices and a commitment to client satisfaction.